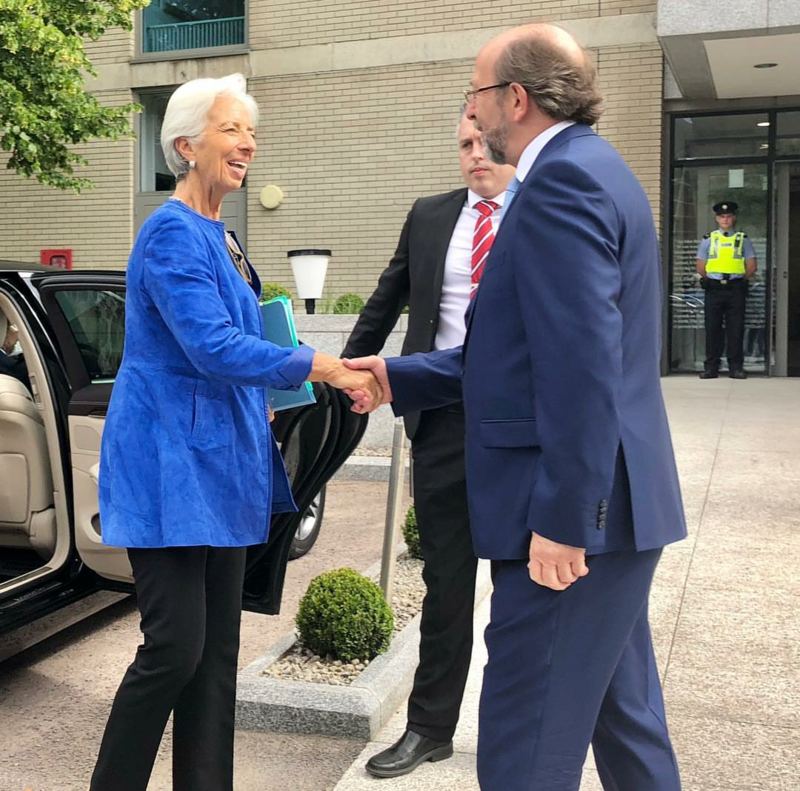 While speaking at various events in Dublin this June, Christine Lagarde also visited DCU and spoke with Professor Brian MacCraith about education and innovation. Image Credit: DCU Instagram Page. Christine Lagarde, chief of the International Monetary Fund (IMF), visited DCU and spoke about inclusion, education and innovation last Tuesday. While in conversation with Professor Brian MacCraith, President of DCU, Lagarde called on Ireland to invest further in the education and innovation sector. She also talked about Europe and the EU, “the future of which is at stake,” she said. Professor Daire Keogh, Deputy President of DCU, said: “As a Director of Women for Election, I was struck by her emphatic endorsement of quotas. She is correct, the move towards equal gender representation in senior positions, on boards, in politics, and within universities is taking too long. Dramatic corrective measures are required”. The former French finance minister who is serving her second term as IMF chief, was in Dublin this week speaking at various events including one hosted by the Central Bank. Despite the public animosity towards the IMF from Irish people over the years, Lagarde welcomed unsolicited questions from the floor. “In her public persona, Christine Lagarde is incredibly impressive, but I was very struck by her warmth and humility,” said Keogh. While at the University, Lagarde also greeted members of DCU’s Enactus Society, which is part of a global social enterprise initiative, who was on the team that won the Enactus Ireland Competition and will be competing in the Enactus World Cup. “She was so lovely and really engaged with what we were trying to achieve. She asked about our projects and the causes we were trying to tackle. She was interested in the world cup and how we were promoting our projects online,” said Conor Greene of the DCU Enactus Society Committee. The eighth most powerful woman in the world, according to Forbes, also touched on past experiences that moulded her. “When it gets tough, grit your teeth and smile and get on with it,” she said while reflecting on her time as a synchronised swimmer. Image Credit: DCU Instagram Page.